Rebecca values community and gives back by supporting local and international charities. She is based in Georgia and is available for travel worldwide. 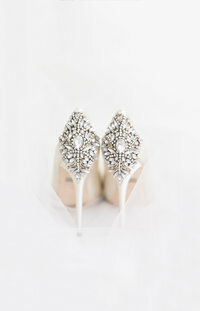 Described as a free spirit and a feeler, she is captivated by the raw emotion and beauty of each new wedding celebration. She is passionate about capturing fleeting moments and turning them into tangible memories. 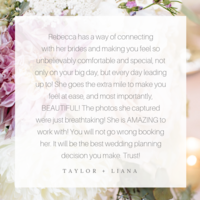 Rebecca Cerasani is a trusted wedding professional who has artfully preserved her clients' memories for more than a decade at over 200 weddings nationwide. 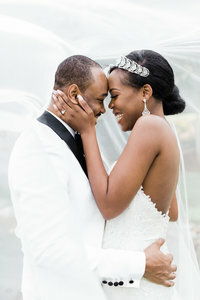 Described as a free spirit and a feeler, she is captivated by the raw emotion and beauty of each new wedding celebration. She is passionate about turning fleeting moments into tangible memories. Rebecca values community and gives back by supporting local and international charities. She is based out of Atlanta, Georgia and is available for travel worldwide. Tickle fights, my daughter's curly red hair, my son's big blue-green eyes, Disney songs, cool nights around the fire pit, uncontrollable laughter, star gazing, Jesus love, butterfly kisses, quiet cuddles, coffee dates, shoulder massages, date nights, after-kids-go-to-sleep romance. These are a few of my favorite things. I'm not sure there is anything more beautiful to me than seeing vulnerability in others. Floating in the magical bays of Puerto Rico, watching the morning sun hit the snowcapped Colorado mountains, not knowing where the sky ends and water begins in the Eastern Caribbean, feeling the power of Niagara, gazing out over the Grand Canyon, racing to the best views at Garden of the Gods during sunset, horseback riding in the Mohave dessert, running through NYC in the rain. These are moments that have left me breathless.